What's Different about Managing Clouds? Delivering services in cloud based environments allows IT to provide new levels of availability and performance based on the scalability and elasticity of the cloud. However, to realize these benefits of cloud computing new levels of monitoring and management are needed. This session will show how in-depth monitoring data coupled with real-time predictive analytics and automation can enable you to deliver the benefits of cloud computing to your organization. Learn how to evolve your service management capabilities to get the maximum return from your investment in cloud computing, increase customer satisfaction and improve business results. 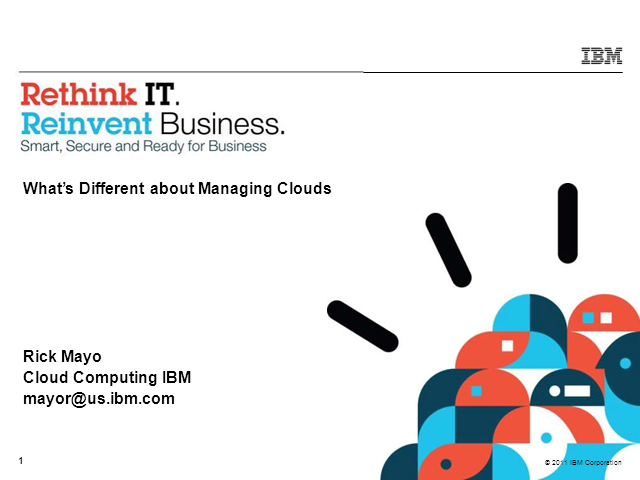 Title: What's Different about Managing Clouds?